Our gift baskets are very well made and sturdy. They have two handles on the side and are stained in light brown. Basket's dimensions are: Diameter: 13.5" Height 5" (7.5" with handles). We shrink wrap and then tie the basket with 1/2 inch satin ribbons. PORCELAIN CUPS Traditionally designed fine porcelain cups and saucers by Kutahya Porcelain, the leading porcelain tableware manufacturer in Turkey since 1973. COPPER TURKISH COFFEE POT Our coffee pots hand made by experienced artisans in Turkey. They are made with 1 mm heavy thick copper with tin lining inside for ease of cleaning and they are 100% lead free. Handles are individually turned on a lathe and then varnished. Copper is the perfect material to use for making Turkish coffee because, more than any other metal, is known for its ability to diffuse heat evenly and conduct it quickly throughout its surface. They are easy to care for, needing only an occasional cleaning with a soft, damp cloth. Also, they tend to look better and gain more character as they age...just like people! Coffee Pot: Capacity 8 oz - Height 3.0" - Diameter 3.0" at base Cups: Height 2.5" - Diameter 2" Saucers: Diameter 4" COFFEE SAMPLES 1. Kurukahveci Mehmet Efendi has been roasting coffee since 1871. Today, it is the biggest and the oldest coffee company in Turkey. (8.8 oz / 250 g) 2. Loumidis Papagalos Greek coffee is a traditional blend from Greece. (17.1 oz / 500 g) 3. 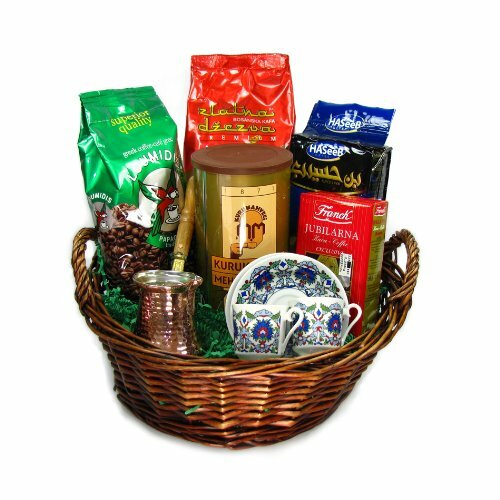 Zlatna Dzezve is a premium Bosnian Coffee from Bosnia and Herzegovina. (17.1 oz / 500 g) 4. HASeeB is a Syrian coffee company that has been roasting since 1942. This is an Arabica blend with 10% cardamom. (17.1 oz /500 g) 5. Jubilarna coffee is exclusively made by Franck d.d. in Zagreb, Croatia. (8.1 oz / 200 g). PLEASE NOTE: Turkish Coffee World products are made to our specifications and must meet our high quality standards. Others may use our listing and pictures to sell on Amazon, but may offer inferior products. If you have any questions about this product by Turkish Coffee World, contact us by completing and submitting the form below. If you are looking for a specif part number, please include it with your message.